Police officers, prison guards and other government officials who improperly abuse the rights of individual Americans have long been recognized in federal law as a threat to society as a whole. That's why, immediately after the Civil War, Congress approved Title 18 USC 242 -- a statute making it a crime to deprive any person of their rights "under color of law." But, as case-by-case Justice Department records make very clear, a law on the books does not always translate into a law that is enforced. In this particular case, for example, the latest available Justice Department data show that federal prosecutors declined to file charges against virtually all -- 98.7% -- of the individuals who the investigative agencies had concluded were in violation of 18 USC 242. Here are the numbers. In the first three months of FY 2004 the Justice Department in one way or another disposed of matters against 230 individuals where this law was the principal charge. For 227 of these matters, the Justice Department declined to file formal charges. In three of the cases the individuals were prosecuted and convicted. By almost any measure, the proportion of official abuse cases that the prosecutors decided they would turn down is extraordinarily high. The best way to understand this reality is to examine the department's declination rates under other statutes. For individuals targeted for tax evasion (26 USC 7201), 40% were declined. For those persons who the agencies felt had violated a law against the sexual exploitation of minors (18 USC 2252) , 51% were declined. For those the agencies felt should be charged with embezzling funds from federal programs (18 USC 0666), 61% were declined. And finally, for matters charging an individual with attempting to re-enter the United States after being previously removed (8 USC 1326), only 7% were refused. Looked at for the entire period, the data show that the declination rates for official abuse matters have been extremely high under every administration going back to President Carter with only marginal differences relating to which party controlled the White House. See graph and Table 3. The case-by-case Justice Department information documenting this long record of inaction was obtained under a series of FOIA actions brought by the Transactional Records Access Clearinghouse (TRAC). The original sources for the material are the semi-autonomous U.S. Attorneys who have a powerful voice in determining how the federal laws will be enforced in their individual districts. Although the department has been collecting enforcement information from the U.S. Attorneys for many decades, the adoption of a consistent coding system in 1986 has meant that since that year it has been possible to systematically track how a variety of laws are enforced in different parts of the country. For the entire period from FY 1986 to FY 2003 the data show that federal prosecutors in one way or another disposed of 43,331 matters in which the primary charge was the "color of law" statue. Consistent with the finding about the handling of these cases in the most recent available period, almost all of them, 98% of the total, never resulted in a prosecution. The information indicates, however, that during the whole 18-year period there was some district-to-district variation in the proportion of the 18 USC 242 matters that the prosecutors decided should not face formal criminal charges. Here is the background. For these years, the record shows that 51 of the 94 federal judicial districts were active, with each processing -- declining, prosecuting, or otherwise handling -- 200 or more such matters. Among these 51 districts with a substantial number of relevant matters there were two in which every single referral from the investigative agencies, 100% of them, were declined. The two districts were California East (Sacramento) and Illinois Central (Springfield). In addition, there were seventeen districts which processed 200 or more official abuse matters where virtually all, 99% or higher, were rejected. Here are these districts. They are listed in numerical order, with the busiest districts first, along with their principal cities. Texas South (Houston), Louisiana East (New Orleans), Texas West (San Antonio), Texas East (Tyler), Texas North (Fort Worth), California North (San Francisco), Pennsylvania West (Pittsburgh), Rhode Island (Providence), Georgia North (Atlanta), District of Columbia (Washington), New York North (Syracuse), New York West (Buffalo), Tennessee East (Knoxville), Louisiana Middle (Baton Rouge), Utah (Salt Lake), Washington West (Seattle), and Alabama Middle (Montgomery). See the adjacent table link for the entire list of districts. There were indeed a handful of relatively busy districts where the percent of matters declined was a slightly lower -- in which the overall declination rates for the whole period ranged somewhere between 92.0% to 96.0 %. These districts, again listed in order of the number of matters handled, included the following. Florida South (Miami), Indiana South (Indianapolis), New Jersey (Newark), Tennessee West (Memphis) , New Mexico (Albuquerque), , Georgia Middle (Macon) , Arkansas East (Little Rock), Illinois North (Chicago), Kentucky West (Louisville), and Tennessee Middle (Nashville). At the other end of this very minimal enforcement scale were four districts where the declination rates for official abuse matters during the whole period were substantially lower, although in each of these areas the total number of cases disposed of was relatively small. The districts where a larger proportion of referrals resulted in a prosecution were New York South (Manhattan), Puerto Rico (San Juan) , New York East (Brooklyn), and North Carolina West (Ashville). As already noted, 18 USC 242 has been on the books since the middle of the 19th century. But it wasn't until the early 1960s -- under President Kennedy -- that the Justice Department became marginally more active in enforcing this and other civil rights laws. It also was in this period that the historically reluctant Federal Bureau of Investigation took on the lead role in investigating all kinds of civil rights cases. But, as the data make very clear, the role of the federal government as the court of last resort when it comes to dealing with abusive government officials has long been spotty, with almost all of the matters recommended for prosecution by the FBI being declined by the assistant U.S. Attorneys. The question is why? In a statement to Congress several years ago the Civil Rights Division acknowledged that only a very small number of such cases ever resulted in a prosecution. Given the special nature of such cases, the division contended, this outcome was not surprising. "The victims of most official misconduct cases tend to be unsympathetic while the defendants often are well respected members of the community," the division explained. "As a result, virtually all of these cases require extensive and time consuming investigative efforts on the part of both the lawyers and the investigators." But the statement does not directly and fully explore why almost all of these matters referred to the Justice Department for prosecution are rejected. Is it just because some of the complainants are unsympathetic? Or that many of the accused are police officers? Or do the data also suggest systematic failures in the quality of the investigations, almost all of them by the FBI? As noted in TRAC's previous report on the handling of all kinds of civil rights violations, however, every time an assistant United States attorneys makes a decision about how a particular case will be processed he or she is required to explain the reasoning that led to the chosen action. Why Do Prosecutors Decline to Prosecute? So, looking only at the 230 official abuse matters disposed of in the first quarter of FY 2004, what reasons did the prosecutors cite when deciding how they would handle them? For a bit more than two out of three of the matters -- 69% of them -- the prosecutors said they had been rejected for one of four specific reasons: lack of evidence of criminal intent, minimal federal interest, no federal offense evident, or weak or insufficient admissible evidence. Curiously, for most of the remaining matters, 22% of the total, the prosecutors said they had declined them as the result of an "agency request" or "per instructions from the Department of Justice." In previous discussions with TRAC, FBI officials have said the very high declination rates can be explained by the fact that the bureau does not screen out the weak matters, that every single complaint is investigated and then referred to the prosecutors for their consideration. But annual budget statements from the Justice Department's Civil Rights Division appear to suggest that this may not be the whole story. For many years, the division has stated that it has consistently received approximately 12,000 complaints each year about civil rights violations of all kinds from individual citizens and the FBI. Most of these complaints, the division statement explains, are "reviewed," a smaller number of them --in recent years about 3,000 of the total -- are "investigated." And as a result of these investigations, somewhat less than 100 matters are sent to the federal grand juries each year and an even small number result in a prosecution. Clearly, a great deal of screening is being done by the government at various stages in the enforcement process. So many difficult questions remain unanswered. Do the case-by case explanations from the assistant United States attorneys indicate that many of the FBI's investigations of official abuse matters are in fact incomplete or inadequate? Or, as suggested in the Criminal Division statement, do the competing social characteristics of the complainants and the accused lead the prosecutors to make a social decision, to decline some cases that truly merited going to trial? Because of the very small number of official abuse matters that are ever prosecuted, determining the enforcement trends in this area is very difficult. Although Department data do show a dip in the two most recent years, this is still within the range of past observed variation. See Table 7. Here are the fiscal year counts for the last five years. In 1999 there were 42 prosecutions. 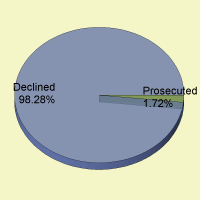 In 2000 and 2001 the number of prosecutions climbed to 50 and 54, but then declined to 43 in 2002 and 34 in 2003. See graph. Ten cases were filed in the first quarter of 2004. 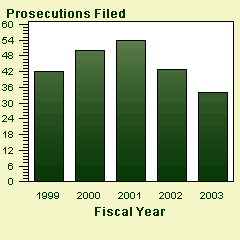 Thus, looked at over a the past decade and a half, the prosecutions have remained in a similar range. Support for this project was received from the Carnegie Corporation of New York, the John S. and James L. Knight Foundation, and the Leadership Conference on Civil Rights Education Fund.